During the 133. 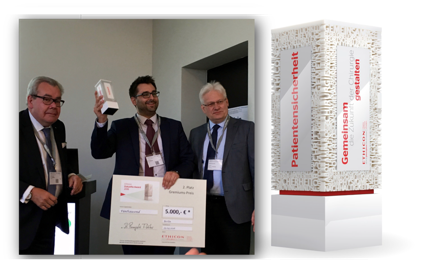 Meeting of the Deutsche Gesellschaft für Chirurgie Dr. Panagiotis Fikatas was awarded with the Ethicon Zukunfts-Award 2016 (2nd place) – Congratulations! Being the winner of the Rising Stars Video Session organised by the YPT Committee at the ESOT2015 Brussels Congress Karl Hillebrandt gave an interview for the ESOT | YPT webpage. His abstract "Optimized decellularization of rat livers byarterial and portal venous perfusion underoscillating pressure conditions" and the accompanying video were the most voted at the Rising Stars Session, where the audience voted live for the best video abstract. You can read Karl's abstract in the special ESOT2015 issue of Transplant International. Karl Hillebrandt won this year's YPT Rising Stars Video Session Award. He presented the studies on „Optimized decellularization of rat livers by arterial and portal venous perfusion under oscillating pressure conditions“ during the 17th congress of the European Society for Organ Transplantation (ESOT) 2015 in Brüssel. Young Professionals in Transplantation (YPT) is a forum for junior professionals throughout Europe working in the field of transplantation. 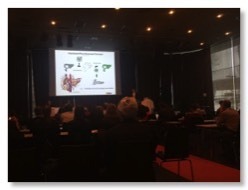 Ben Strücker presented our latest results on DECELLULARIZATION OF WHOLE RAT PANCREATA – EVALUATION OF THREE DIFFERENT PERFUSION ROUTES at the 5th EPITA Winter Symposium in Innsbruck from the 25th to the 27th of January 2015. He received the AIDPIT&EPITA Award for the best oral presentation. Congratulations! Ben Strücker presented three effective protocols for rat pancreas perfusion decellularization, evaluating different perfusion routes. In contrast to liver decellularization the perfusion route seems to have no major impact on decellularization results. The dPECMs could serve for cellular repopulation with islets from a different (xenogene) origin to generate functional, transplantable endocrine pancreata in vitro. The XXXX ESAO Congress took place in Glasgow, September 11th - 14th, 2013. 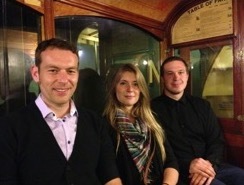 This year we had three oral presentations focussing on our latest results in decellularization and recellularization of the liver. Ben Strücker presented our latest results on „Improved rat liver decellularization by arterial perfusion under oscillating surrounding pressure“. Antje Butter and Karl Hillebrandt gave two oral presentations during the yESAO Rapid Fire Session on „Proprietary rat liver decellularization device utilizing oscillating surrounding pressure to improve micro perfusion within the organ“ and Pig liver decellularisation through portal vein and hepatic artery perfusion under oscillating surrounding pressure“. Furthermore, Karl Hillebrandt received the „2. Prize for the best Poster“! 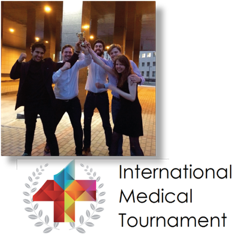 in liver transplantation" was awarded with the GASL 2013 poster prize during the 29th Annual Meeting of the German Association for the Study of the Liver (GASL) in Hannover, Germany. Co-authors are Kukuh A. Prabowo, Anja Reutzel-Selke, Rosa B. Schmuck, Mehmet H. Morgul, Laura M. Tannus, Stephanie König, Sven Jonas, Peter Neuhaus, and Igor M. Sauer. Although 20–40% of patients experience at least one episode of acute rejection (AR) after liver transplantation (LTx), diagnosis of AR is still mainly based on tissue analysis from liver biopsies. Biomarker routinely taken from blood samples would be a powerful non-invasive tool for monitoring of the liver graft status. The aim of this study was to investigate the diagnostic and prognostic value of serum protein biomarkers for acute rejection in LTx recipients. Serum samples from n=20 patients with AR and n=15 stable controls were analyzed. CXCL9 and CD31 were up-regulated in AR samples compared to controls at the time point of histologically proven rejection and at earlier time points prior rejection. Areas under the Receiver Operation Characteristics (ROC) curves were 0.6 and 0.7 at the day of rejection and 0.8 at POD1 for CXCL9 and CD31, respectively. IL-6 was increased prior and during rejection, while CD44 showed an opposite trend. Serum protein biomarkers could be valuable for detection and prediction of AR after LTx. However, a larger number of patients, additional control groups, and prospective clinical trials will be necessary to proof the clinical utility of this diagnostic tool. Moreover, Rosa Schmuck presented her data on "Bile: miRNA pattern and cell morphology as a diagnostic tool after liver transplantation" (co-authors: Nathanael Raschzok, Anja Reutzel-Selke, Steffen Lippert, Stephanie König, Kukuh A. Prabowo, Mehmet H. Morgul, Laura M. Tannus, Sven Jonas, Peter Neuhaus, and Igor M. Sauer) and Luisa Lisboa her work on "MicroRNA miR-352 in early liver regeneration: what role?" (co-authors: Nathanael Raschzok, Annekatrin Leder, Natalie Schlüter, Marc Jörres, Susanne Kolano, Antje Butter, Steffen Lippert, Wiebke Werner, Peter Neuhaus, and Igor M. Sauer). Today, Rosa Schmuck received the 2012 Charité Robert-Koch-Prize for her doctoral thesis entitled „Genotypic and phenotypic characterization of side population of gastric cancer cell lines“ (group of Prof. C. Röcken). The Side Population (SP) of tumor cell lines shares characteristics with tumor stem cells. In this study we phenotypically and genotypically characterized the SP of gastric cancer cell lines. SPs were obtained from MKN45- and AGS-gastric cancer cells using Hoechst 33342 staining and fluorescence-activated cell sorting (FACS). SP cells were subsequently studied morphologically (cytology, immunocytochemistry), on the transcriptional level (gene array) and in cell culture (recultivation assays). Genes differentially expressed in the SP cells were evaluated by immunohistochemistry in tissue from gastric cancer patients. SP cells were smaller and rounder then Non-SP cells. SP cells self-renewed in re-cultivation experiments and differentiated into SP- and Non-SP cells. Re-cultivated SP- and Non-SP cells showed distinct phenotypes in culture regarding cell shape and colony-formation. SP cells had increased levels of the stem cell markers CD133 and Musashi1. Transcriptional analyses demonstrated that SP cells express genes that encode for stem cell properties like FZD7, HEY1, SMO and ADAM17. Finally she found ADAM17 and FZD7 to be differentially expressed in human gastric cancer, with FZD7- positive intestinal type cancers showing a significant shorter patient survival. In conclusion human gastric cancer cell lines enclose a phenotypically and genotypically distinct cell population with tumor stem cell features. Phenotypical characteristics of this distinct cell population are also present in gastric cancer tissue and seem to correlate with patient survival. The postgraduate program offers an up-to-date overview on pressing clinical and basic science topics with relevance for all participants of the Berlin 2012 meeting. The program is designed to provide clinicians with an overview of the most recent advances in basic research in a bench-to-bedside approach. Updates on immunosuppression, organ-specific processes, organ supply, immune monitoring and the relevance of animal models in transplantation will help both clinicians and researchers with basic information aligning their efforts and providing the best care of transplant patients in the years ahead.